If you walk by the UT Tower and you look up above the belfry, near the very top, you can just make out a small wooden box. In that box lives a lonely bird that might be the only peregrine falcon that’s a permanent resident in the area – but some hope she won’t stay lonely forever. Back down on the ground, you can often see a tall man with a white beard and a camera. His name is Chris DuCharme. Last Friday, he was doing what he does every day lately: checking up on the bird. DuCharme, who is retired and in his 60s, spends a lot of time these days photographing birds. After going through years of photos, he realized this one falcon never leaves Austin. He calls her the Tower Girl – she lives on the tower and she's a girl, after all – and right now is a special time of year for her. About six weeks ago, she started laying eggs. She’s up there sitting on them, which is why DuCharme been visiting so frequently. The same thing happened last year, but the eggs never hatched. Being the only permanent resident, the Tower Girl doesn’t have a mate. So, it’s likely that these eggs are not fertilized either. But male peregrines do visit Austin in the winter, so it’s not out of the realm of possibility. The thing is: The clock is ticking. If nothing hatches after six weeks, odds are these eggs are never going to hatch. “I’d just like to see it work out for her,” DuCharme says. “We’ve basically given it through this weekend and that’s even allowing for time that we miscalculated." "I do this every day, and she's the reason why. Every time I take a picture, it's like I'm thinking of her." So DuCharme sits, staring at the tower. He talks about the lifecycle and range of falcons, how peregrine falcons were almost completely wiped out years ago, and how he became interested in photographing birds. He says it started with his wife, Caryl Dalton. “We were just birders; we liked to watch,” he says. “I would send her email photos that I had taken, so that she could look at them at different times. I would call them 'photos' or 'snaps' or 'pics' -- anything but photographs. And finally one day she said, 'Chris, you’re a photographer. You take photographs. End of discussion.'" Caryl passed away in 2012. 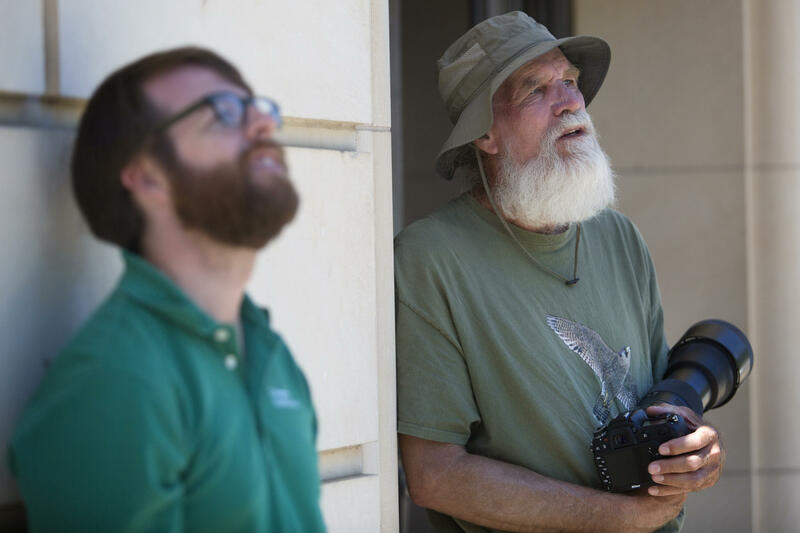 Phil Butler (left) joins Chris DuCharme as he waits for a sign that the eggs belonging to a peregrine falcon he calls the "Tower Girl" have hatched at the UT Tower. While DuCharme waits, he attracts the attention of passersby. Schoolchildren wave as they walk by; a sharply dressed man visiting from out of town asks what he's looking at; and a university employee named Phil Butler joins DuCharme on his lunch break. Butler admits he's rooting for the eggs. "But I also know that she faces a lot of challenges trying to do it by herself," he says. There’s a little excitement when two vultures make for the Tower, but nothing comes of it. Most of DuCharme's time is spent just staring, almost in a state of self-hypnosis. Then, suddenly, the Tower Girl springs from the box. Cutting circles in the air near the tower, she’s designed perfectly for speed. She’s not flying so much as shooting through the sky. DuCharme watches for a sign that she’s seeking prey — any indication that the eggs have hatched. But she returns to the box quickly, talons empty, and disappears inside. Days later, DuCharme says there hasn't been any development. He says, if things go like they did last year, the falcon will start spending less and less time on the nest. "Letting go," he calls it. But, DuCharme says, he plans to keep visiting and taking pictures – one loyal companion for the Tower Girl. Walls. They can shelter us. They can divide us. But can a wall itself become an object of curiosity? Well, one wall on the campus of UT Austin has done just that.